Marvel Entertainment in the house! New York Comic Con is shaping up to be a Marvel fan’s dream experience with a newly announced lineup that includes events from Marvel Television, Marvel New Media, Marvel Animation, Marvel Comics, Marvel Games and Marvel Themed Entertainment. The marvel-ous fun starts on Thursday, October 4th through Sunday, October 7th. 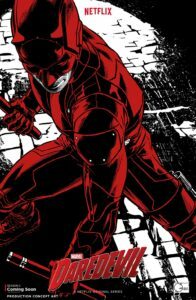 For the first time ever, on stage at Madison Square Garden, fans will get an exclusive first look at both Marvel’s Daredevil and Marvel’s Runaways. But if that’s not your cup of tea over at the Javits Center the cast and crew of The Gifted will be showing an exclusive of their own–a sneak peek of the first episode of the second season. Not to be outdone Marvel Animation has plans for a spectacular Marvel Rising panel as well as the annual Marvel Animation Presents panel where they will share news from upcoming Marvel Animated projects and show a special screening of the television film Marvel Rising: Secret Warriors. Marvel Comics will make their return to the con with a plethora of treats for the fans that run the gamut from surprise guests to exciting giveaways. The fans will also get the pleasure of hearing from the top writers, artists and editors as the talk about some of the fan’s favorite characters in the Marvel Universe as well as a sneak peek at what’s next. The fans at home shouldn’t fret because they can join in with the fun via Marvel New Media as it offers fans four days of streaming coverage on Marvel.com as well as the Marvel social media platforms. Fans will have the opportunity to witness panels hosted by Marvel New Media such as This Week in Marvel and Women of Marvel, as well as a live episode of Earth’s Mightiest Show. Marvel’s Games’ contribution to the con will come in the form of some of the hottest games including, Marvel Contest of Champions, Marvel Puzzle Quest, and Marvel Battle Lines. Check out @MarvelGames on Twitter for more exciting news coming soon. Finally, a huge fan favorite, Marvel booth (#1354), returns and it promises not to disappoint. Fans will have the opportunity to attend signings of their favorite stars, compete in costume contests and an array of other events that will touch on all parts of the Marvel Universe. If you don’t want to miss any news or updates check out the livestream that will begin on October 7th on Marvel.com. There will also be the hashtag, #MarvelNYCC so fans can join in on the conversation on Twitter, or you can ‘Like’ Marvel on Facebook to receive minute to minute updates all weekend long. If you are a Marvel fan this is one event that should not be missed.